I am an étouffée neophyte. Gumbo, po’ boys and jambalaya are some of my favourite things to eat but I somehow missed the étouffée train. I do have a habit of hiding under rocks sometimes only sticking my head out like a meerkat when I sense someone under-seasoning but still…how did I miss this? Vegan étouffée is so good. Étouffée is steeped in Cajun tradition. 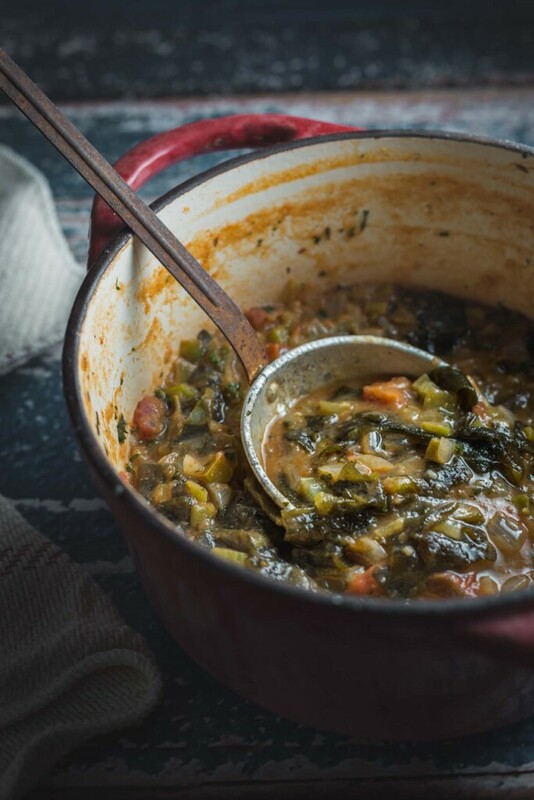 A rich almost buttery stew with a name that literally means “smothered” or “suffocated” in French. Suffocated is apt although less dramatically the term is used here to denote a style of cooking. Seafood, crawfish or shrimp, is smothered in vegetables and a tomato sauce creating a stew-like dish. My vegetable étouffée may defy the laws of traditional Creole cuisine but it is seriously yum so perhaps a justifiable culinary crime. 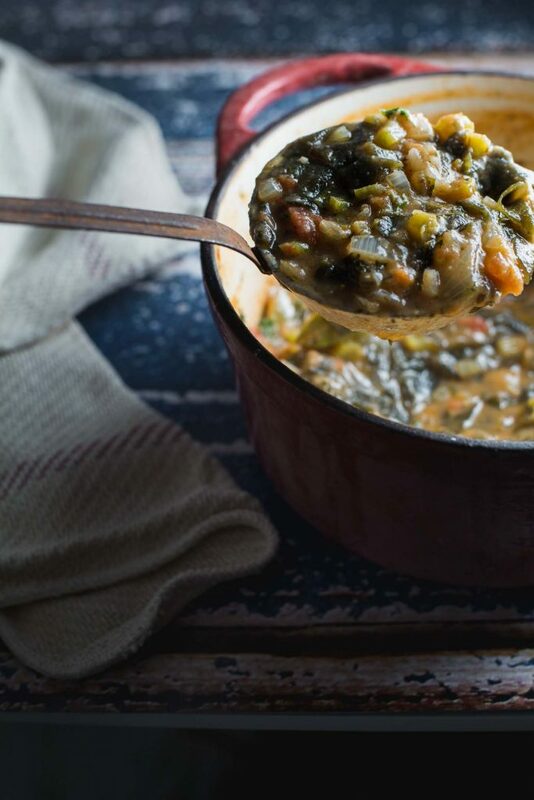 Buttery, spicy and tinged with a taste of the sea, this vegetable étouffée is a vegan trip down the bayou. Étouffée is the girl in the Counting Crows song Mr Jones dances with. While Adam Duritz is checking out a beautiful Dutch blonde, Mr Jones dances with a dark haired flamenco dancer and low and behold, she’s suddenly beautiful. What a fickle pickle you are, Adam. Étouffée is not a beautiful looking dish. Truth be told I had a devil of a time finding its best angle while photographing it. But as with all truly beautiful things, it’s beauty is on the inside. Sure it might appear to be a mish-mash of indistinguishable elements but those elements have integrity. 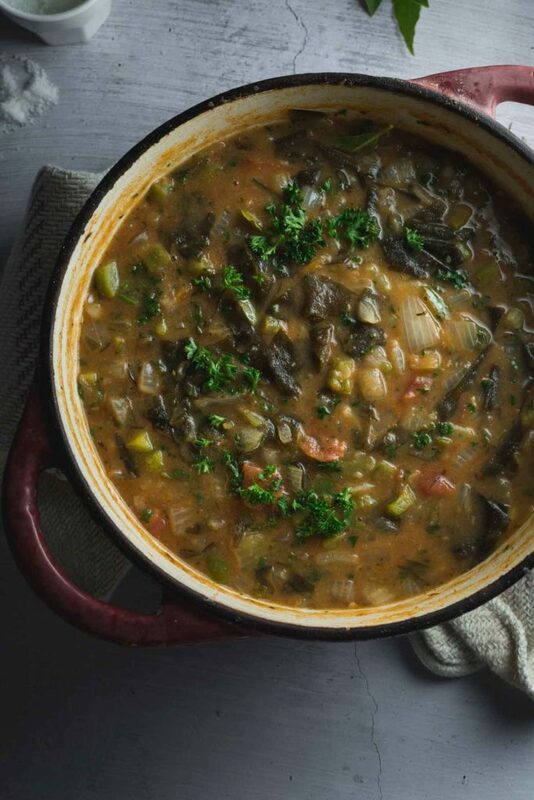 Each ingredient in this vegetable étouffée adds to the rich complexity of the dish. It has a purpose and the dish would suffer without each one. So, while no-one is ever going to confuse vegetable étouffée with a prettily perfect Dutch speculaa, make no mistake, it is beautiful. A beautiful, rich and spicy bowl of yum. I based this recipe on Emeril Lagasse’s Shrimp Étouffée . Two things to note, one, adding tomato makes this étouffée more Creole than Cajun and two, and I’m sorry, there is a fair amount of chopping. See how I used misdirection there? Wow look over there at that interesting historical factoid while your ceaselessly chopping. If your food processor is working, the chopping is not a problem. If, like me, your processor’s lid jumped from your hands in a fit of pique, there is manual labour. Sorry. How to make Vegan Étouffée? Making étouffée vegan was surprisingly easy. Lagasse’s recipe calls for a hefty does of butter for the roux so we simply exchanged that for vegan butter (and a lesser quantity). To add a little sea to the dish I soaked dried wakame and a teaspoon of shiro miso paste in boiling water for 30 minutes. If you aren’t meat free, fish stock will give you your taste of the ocean. If you are a lover of all things in a bowl like my Spicy Chickpea and Couscous bowl you will love this vegetable étouffée. It is rich and buttery but oddly light to eat. The dish’s spiciness also cuts through the richness. I pair mine with cooked quinoa rather than the traditional rice to further lighten the dish. For the spice, I followed Emeril Lagasse’s recipe for Bayou Blast. It is gorgeous. Store the remaining mix in an airtight container and add to any recipe whenever you are feeling the need for a little Creole love. Enjoy, x. 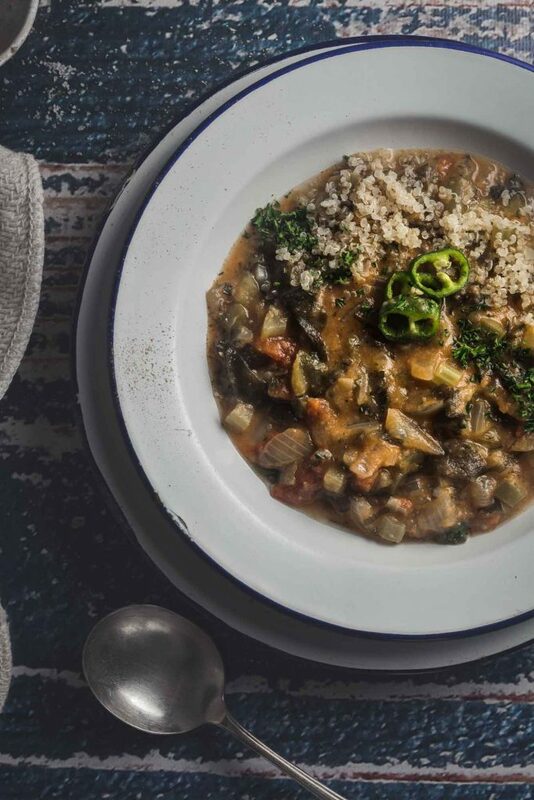 Buttery, spicy and tinged with a taste of the sea, this Creole-style vegetable étouffée is a vegan trip down the bayou complete with a good kick of Essence. Combine 4 cups of boiling water with miso paste and wakame. Leave for 30 minutes. Heat a cast iron or heavy bottomed pot and melt butter over medium heat. Add the flour and stir to make a roux. Stir continuously until the roux is the colour of peanut butter or caramel, about 7 minutes. Add the onions, green peppers, celery and garlic to the roux,. Cook, stirring often, for 10 minutes. Strain the wakame broth keeping the wakame aside. Add tomatoes to the pot. Add the bay leaves, salt, cayenne, and 1 1/2 tablespoons of Essence. Cook for 2 to 3 minutes and then stir in the wakame broth. Bring the mixture to a boil and reduce to a simmer. Chop the wakame and add to the pot. Cook the étouffée, stirring occasionally for 20 minutes. Add the chopped parsley and stir to combine. Serve with cooked quinoa or rice and garnish with sliced chilies. I recently was considering Creole dishes which I had the experience and joy to research when I managed a Creole Cafe in Pa. The chef I had hired had no concept of New Orleans style menu which we offered so together we learned. In recent years becoming a vegetarian etc. I have missed this style of crooking. I look forward to creating this dish as well as others from your repertoire ! Thanks Jeff. I hope you enjoy the dish – we have to get a bit creative, us veggies. I love this étouffée – it’s spicy and buttery. Let me know how you go!